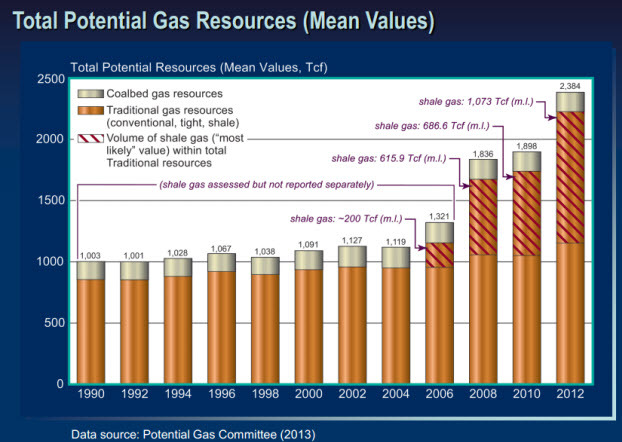 On April 9, the Potential Gas Committee released its biennial assessment of the future gas resource potential of the United States. The new report paints the most vivid picture to date of the shale boom and its impact on the future energy dynamics as they begin to reverberate, not simply through the domestic energy markets, but through the global economy. A little perspective on these numbers: every year the nation produces and consumes about 25 trillion cubic feet of natural gas. The ratio of proved reserves to annual production is about 12 years (historically, this “R/P ratio” typically runs about 10 to 12 years of production). PGC’s report suggests we have undiscovered, “technically recoverable” resources sufficient to replenish reserves at our current rate of production for about 100 years. An important thing to remember about the resource assessment is that it does not address economics. Not all of the resource base would necessarily be economic under today’s technology and today’s economic conditions. At some point the cost of extracting that gas, and expanding the economic frontier, may not be justifiable. That is a function of technology, human ingenuity and the development of alternative fuels that more efficient. The graph also leads to a somewhat counter-intuitive point about resource management. We tend to think of reserves and the total resource base as analogous with inventory in any other business setting. If that were true, resources would be a static, finite quantity. Production and development would cause depletion of resources. Instead, we observe that production and development actually enhance the resource estimate. The estimate adjusts to better technology and more and better data. Resources expand almost uniformly faster than production depletes them. Thus “Drill, Baby, Drill” is not just a political slogan, it is intelligent resource management. A point I have belabored in my “Peak Oil Scribblings“: the original peak oiler M. King Hubbert thought that the total U.S. natural gas endowment (cumulative gas + reserves + resources, a/k/a “estimated ultimate recovery”) was 850 TCF in 1956; by 1978, he increased his estimate to 1,100 TCF. By year end 2012, the nation had produced and marketed over 1,195 TCF of gas, while clipping away at record rates of production. Estimates of reserves and resources have never been higher. Today, our estimate of total endowment stands near 3,900 TCF. Dollars to donuts says the estimate will be even higher two years from now. A look at Qatar Petroleum’s world-standing will shed light on just how significant a move this is, and just how big an impact the shale boom is having on world energy markets. Qatar is the world’s largest LNG exporter by a significant distance with around 78 million tonnes per year (mtpa) [3.7 TCF/yr*] of export capacity, and Qatar Petroleum is the operator of all of it. Its nearest rivals, including Indonesia (34 mtpa), Malaysia (24 mtpa) and Australia (23 mtpa), are dwarfed in comparison. … Qatar, on the face of it, looks to be in an extremely strong position as the global leader of gas exports. Yet it still moved into this new market. The combination of horizontal drilling with modern hydraulic fracturing methods is the key that has opened vast new possibilities for our domestic energy supply picture. Realizing those possibilities is up to us, through realistic resource management and intelligent policy decisions. This entry was posted in Energy, Peak Oil and tagged drill baby drill, fracking, Gas Reserves, Gas Resources, Horizontal Drilling, M. King Hubbert, Peak Gas, Potential Gas Committee, Qatar. Bookmark the permalink.